“Don’t put all your eggs into one basket” – who has not heard this old stock market adage. With Easter approaching, we are having a closer look with the latest figures. The basic principle of diversification, i.e. not to put all one’s eggs into one basket, is without a doubt one of the most important concepts of finance. As early as in the 1950s, Harry Markowitz managed to capture this diversification principle in a mathematical model and to present quantitative solutions. Let’s look at this topic from the perspective of a shareholder. The risk of a share is composed of risk that is specific to the security and of the so-called market risk. An example: let’s assume I hold a share in voestalpine. The company-specific risks are the profit development of voestalpine, the competitive situation in the steel industry, the development of the steel price, and the demand of important customers such as the automotive industry. The market risk affects all shares. This could be the interest rate risk, political risks such as Brexit, or economic developments such as phases of boom or recession. Whoever has invested in individual shares before, knows that individual shares are considerably more volatile than a benchmark index such as for example the ATX or the DAX. The more different shares the portfolio is made up of, the more the volatility of individual shares is balanced across the portfolio and the more my portfolio will be approaching the equity index. The reason for the reduction in risk is the so-called correlation. 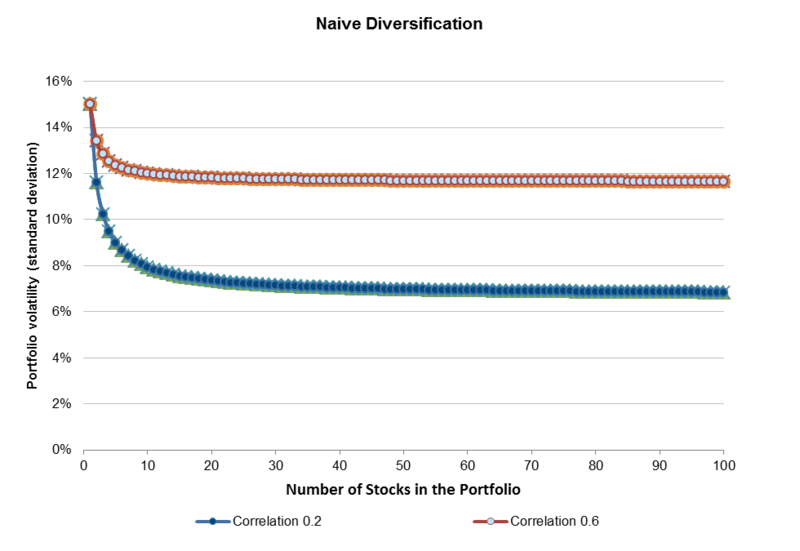 The lower the mutual correlation among the individual shares, the better diversification works. voestalpine has a completely different company-specific risk than Österreichische Post. The risks partially cancel each other out. The more shares from different companies a portfolio contains, the stronger the diversification effect. Ultimately, what remains at sufficiently high levels of diversification, i.e. at a sufficient number of individual shares, is the volatility of the overall market. The diversification effect becomes clearly noticeable in portfolios with equally weighted positions. This form of diversification is referred to as “naïve diversification”. The chart below clearly illustrates this effect. At only one share held, the volatility risk is 15%*). Under the assumption that the shares correlate at only 20% (blue line), the volatility risk clearly falls in line with the number of securities in the portfolio. Total risk is halved at about 16 different shares. At higher levels of correlation, for example 60%, risk diversification is less pronounced as suggested by the red line. In both cases, volatility reduces only slightly after a certain number of securities in the portfolio anymore while approaching the risk that cannot be diversified away. Further reduction is only possible if other asset classes with lower correlation are taken into the portfolio, for example bonds. *) This is a theoretical example; risk in this case is expressed as standard deviation; standard deviation explains the bandwidth of fluctuation of a share in percent; at a probability of about 84%, the development over a year will within a bandwith of 15% either side. Diversification, or risk reduction, also works at bigger scales, e.g. in mixed investment funds. Here, more asset classes are combined. Equities are regarded as particularly risky. The chart below illustrates on the basis of a global equity index that the fluctuation as measured in terms of volatility is highest for this category. The spike of share prices is particularly obvious in the financial crisis of 2008/2009. By mixing US high-yield bonds at a 50/50 ratio with shares as a first step, the risk reduction becomes apparent. The portfolio is gradually expanded by further asset classes, with cash coming in last. Even by only weighting these asset classes equally (i.e. naïve diversification), the risk reduction over this period is obvious. The lower the correlation of the respective asset classes, the bigger the effect of risk diversification. The correlations are not stable, but can raise or fall depending on the given market cycle. For example stocks and high yield bonds are highly correlated in crash cycles. On the other hand equities and government bonds often develop in the opposite direction, hence are negatively correlated. 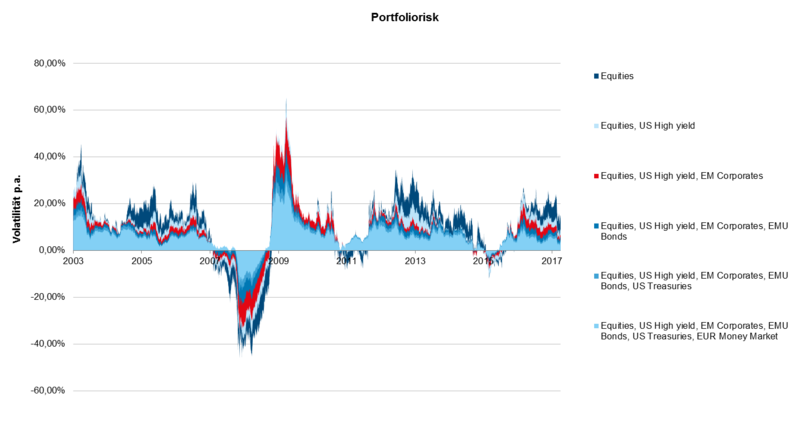 The diversification across various asset classes does not only produce a reduction in risk, but also affects the performance of the various portfolios. The chart below highlights how the different, equally weighted portfolios have performed retrospectively over a rolling 12M period. 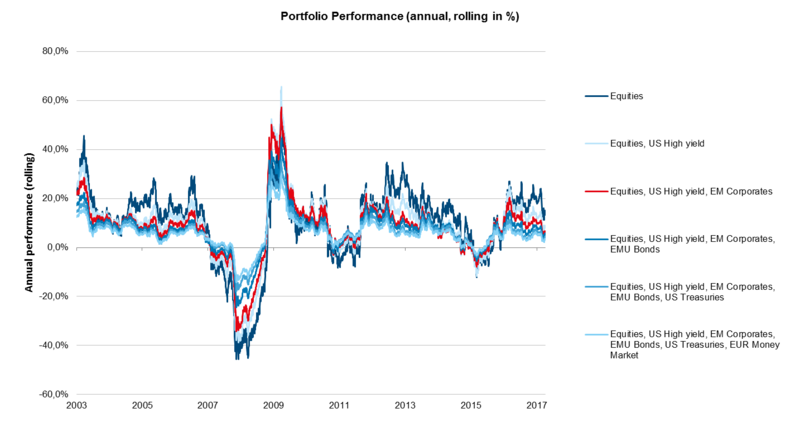 A pure equity portfolio achieved the lowest twelve-month-return over this time span (2003-2018), whereas a portfolio consisting of shares and US high-yield bonds produced the best annual performance in the same period. Noticeably, the more asset classes a portfolio contained, the calmer the time series and the more stable the performance of the portfolio. Sources: Erste Asset Management; various market indices; own calculations; 17 December 2003 – 15 March 2018; in the performance figures are no taxes or fees included; also individual account or custody fees are not considered in this chart. Please note that historic performance is not a reliable indicator for the future development. Fund managers make deliberate use of the diversification effect. Weights are allocated to the individual positions (e.g. shares or asset classes such as shares worldwide, or euro government bonds) on the basis of risk and return aspects. Expected return and risk assessment change over time. Therefore, the positioning of the various asset classes in the fund also changes. The art of fund management is to construct the entire portfolio optimally on the basis of the current assessment of the capital markets. To this end, special know-how is required, and implemented for example in the YOU INVEST funds. The YOU INVEST funds may invest substantial amounts of assets in shares of investment funds (UCITS, UCIs) as pursuant to sec 71 of the Austrian Investment Fund Act of 2011. Diversification – why you should not put all your eggs into one basket for Easter!